The world’s largest solar companies have filled three floors of the Moscone Center in downtown San Francisco this week with solar gear, everything from next-generation solar panels to robots that assemble solar cells. But it’s the batteries, which can store the electricity produced by the solar panels, that have emerged as the real stars of this year’s Intersolar North America show. Battery giants, eager startups, solar firms and European power players all showed off battery products that they hope to sell to homeowners, businesses and utilities in the U.S. These batteries can connect to solar panel systems and store energy during the day to be used later at night. Such battery systems can also be used for backup power in the event of a grid blackout, or also paired with an electric vehicle. 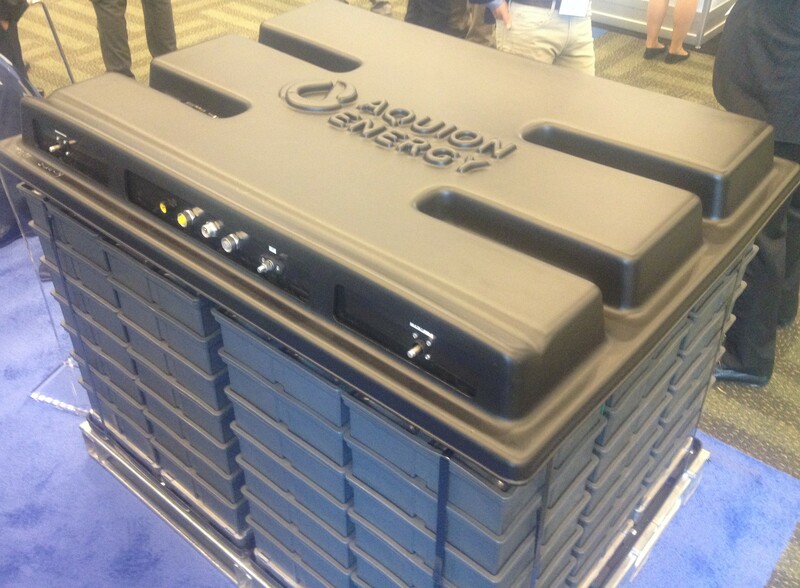 A grid battery from Aquion Energy, shown at Intersolar. Image courtesy of Katie Fehrenbacher, Gigaom. Part of the excitement around grid batteries this year has come from the huge bet that electric car maker Tesla Motors and partner solar installer SolarCity — led by the charismatic Elon Musk — are making on lithium ion batteries. Tesla is building a massive battery factory somewhere in the U.S. that will dwarf the world’s lithium ion battery supply, and the batteries will be used for both cars and paired with SolarCity’s solar panel systems. But one entrepreneur’s attention doesn’t make a market. Energy storage has its own momentum. The entire energy storage market is predicted to explode over the next five years, due to a combination in the growth of solar, state mandates (like the one in California) that are pushing storage, and more unpredictable weather that can cause blackouts and require backup storage systems. Research firm IHS predicts that the energy storage market (which includes batteries but also other storage technologies) will grow from a small base of 0.34 GW installed in 2013 to an annual installation size of 6 GW in 2017 and over 40 GW by 2022. The U.S. is supposed to be the largest market in the world, followed by Germany and Japan. 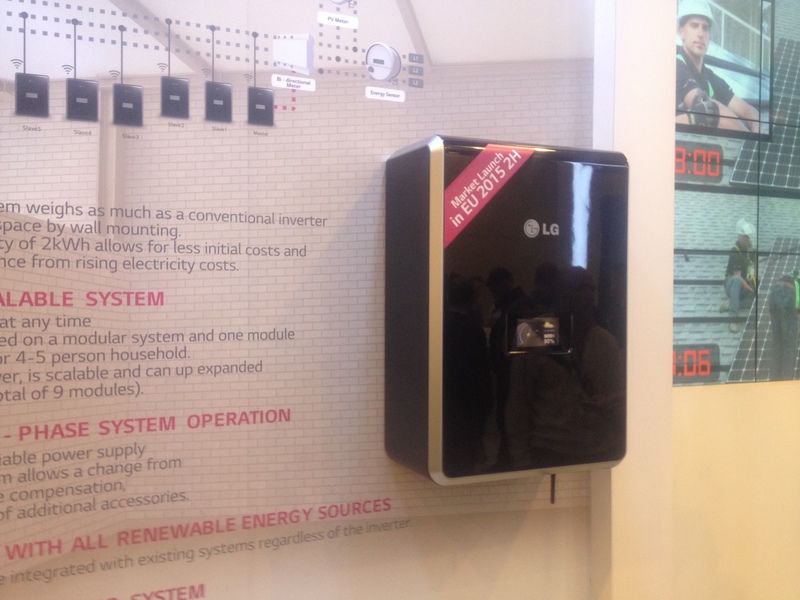 A battery for homes and businesses that LG showed off at their booth at Intersolar, image courtesy of Katie Fehrenbacher, Gigaom. At a booth at Intersolar staffed by Korean electronics giant LG, curious attendees flocked around a battery that LG had quietly placed on a wall with just a few lines of basic information. “Are there any brochures for this?” numerous passersby asked the booth attendants, eager for any data on the device. LG’s Joon Son, manager of the Solar Products Planning Team, told me that the LG energy storage system will go on sale in Europe in 2015, and if there’s demand, in the U.S. in 2016. The product contains a lithium iron phosphate battery that Son said LG procured from another company. LG said it hadn’t set the target price yet. The battery weighs 121 lbs, and has a capacity of 2 kWh, but can be scaled up to 18 kWh (9 modules). The product can also be monitored remotely with a smartphone and can be plugged into any clean energy source, like solar panels. 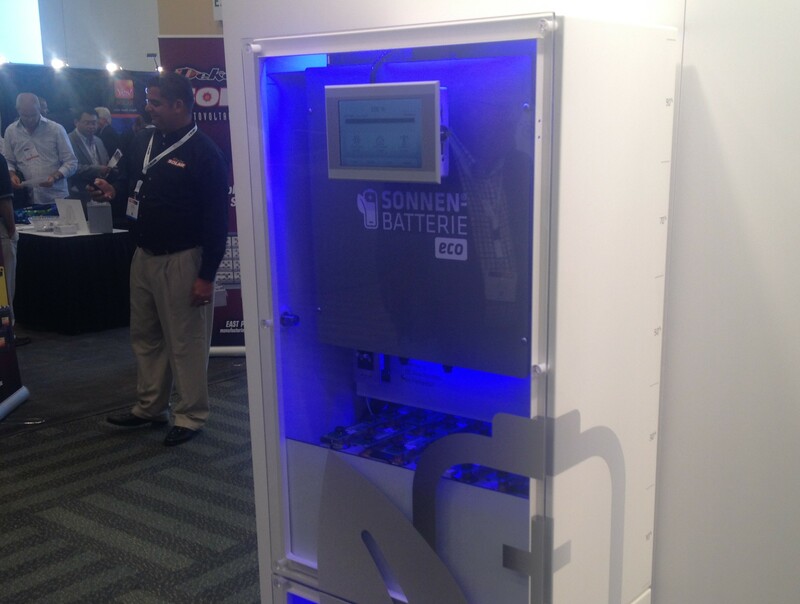 Sonnenbatterie’s battery storage product shown off at Intersolar, image courtesy of Katie Fehrenbacher, Gigaom. LG was just one of dozens of companies showing off batteries that had been wrapped up with computing and turned into smart and sleek systems for solar panels and buildings. Many of these batteries were also being paired with inverters, which are devices that convert the direct current from the solar panel into alternating current that can be used around the house. Most companies at the show were figuring out various ways to package up lithium ion batteries, which is the tried and true standard battery technology used in our laptops and cells phones, as well as Tesla’s cars. But the problem with lithium ion batteries is that they are still relatively expensive. Though, Musk’s and others’ position is that lithium ion batteries will continue to drop in price as they get built at a larger and larger scale. 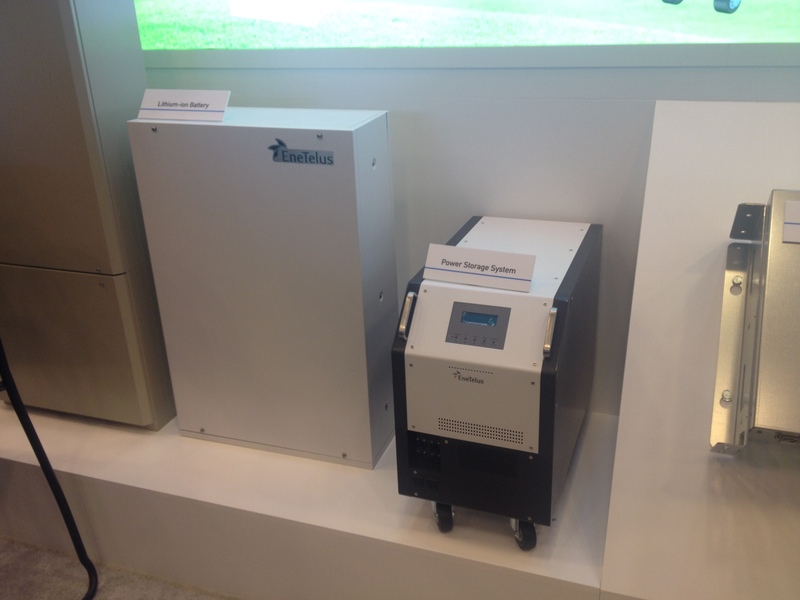 German power company Varta Storage showed off a storage product made with lithium ion batteries and paired with an inverter called Engion. German company Sonnenbatterie showed off three types of storage products — with different functions and price points — made from lithium ion batteries. A 15-month old Valley startup called JuiceBox is selling a box of lithium ion batteries and a controller and they’re looking to team up with solar installers. Outback Power has been selling off-grid batteries for over a decade, but has focused mostly on lead acid batteries. Lithium ion battery pod from Tabuchi Electric, Image courtesy of Gigaom. Startup Aquion Energy was one of the rare companies at the show that wasn’t betting on lithium ion. It has actually invented its own new form of battery made from basic materials like sodium and water (which are cheap and abundant). The battery tech was developed out of Carnegie Mellon University by founder and chief technology officer Jay Whitacre, and this year Aquion moved into early commercial production. Different types of batteries will prove more popular with different customers and for different applications. Lithium ion batteries use high power and provide short, shallow bursts of energy, so that would make them a good fit for frequency regulation for the grid. But utility-scale clean power applications generally need several hours’ worth of sustained, low-power energy. Other battery chemistries like Aquion’s could end up being a better fit for that. One thing is certain, if batteries end up filling up our cars, embedded in every one of our gadgets and in a big box in our homes, the world will need a lot more batteries. Which means all of the companies looking to sell storage products at Intersolar aren’t necessarily in strict competition with each other, they’ll entering a potentially massive and complicated new market. What is the energy loss % of using an Inverter? Does anyone make direct current lighting or any appliances? Which source is more efficient AC or DC under which application (lighting, appliances, small motors, large, industrial motors)? Inverters are typically around 85% efficient. Domestic lighting by LEDs is a technology that is perfectly adapted to low voltage DC systems as many fixtures are already designed with 12V transformers. Low voltage electric motors are already used in portable refrigerators so wouldn’t need much adapting to work with bigger appliances. Higher power appliances are best run off the high AC voltages that an inverter can supply. This is because the sizing of power cables suitable for high current would be very expensive for low voltage high current networks, except for short runs between a battery pack and an inverter. Not only does Solar Energy programs have to battle the negative propaganda promulgated by the oil industry, coal industry, etc., but also the electric companies. They want to maintain their monopoly and large profits, and the ability of a homeowner to own and create their own electricity is a definite threat. Do not expect solar and battery partners to have an easy road against all the major wealthy fossil fuel and utility company propagandists. We rented a small house for a week in Miloli, Hawaii three years ago and there was no electric utility supply. Instead the owner had solar panels on the roof and common batteries to store the electricity. We did not have unlimited electricity and had to be conservative, but the system worked. So I am looking forward to more efficient battery systems permitting individuals to create and store their own electricity and not be controlled by the current energy and utility companies in control of everyone. Thanks for this update. It’s heartening to finally see some focus on batteries. Let’s push for much more; hey’re a real bottleneck. Katie, It’s always a pleasure to read your updates on clean energy. Your updates are what makes gigaom unique. Keep the great work going.